The Seven have taken up positions around the main street, with Vin and Buck up high. The street is quiet--perhaps too quiet--until men ride into town. Chris steps out to greet them but it is obvious that the riders' intentions are not good. They open fire and a gun battle ensues, during which, there is damage to the town from flying bullets and bodies. At the end of the gun battle, the main street is a mess but Seven men are still standing. Billy runs into the street, straight into Chris's arms. In the aftermath, a stagecoach arrives in town and Judge Orin Travis steps out. He is accompanied by Federal Marshal Walter Bryce--the New Law in town. Bryce's first words are to give the Seven 24 hours to either hand in their guns or leave town. 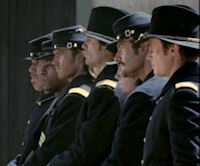 When Bryce moves off, the Judge sits down on the steps and informs the Seven that he was given no choice in the matter, and that Bryce is a good man chosen by the Railroad. When JD asks how they are supposed to protect the town, the Judge tells them that their services as protectors are no longer required. 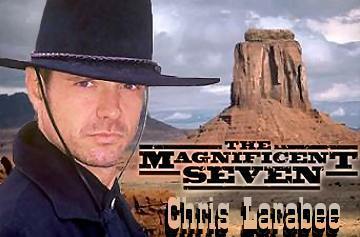 Chris listens quietly for a while and then walks away, aware that the days of the Magnificent Seven are over. Chris is in the stable saddling his horse when Mary arrives. She asks him to stay but he has unfinished business in Purgatorio, searching for the man who hired Cletus Fowler to kill his family. 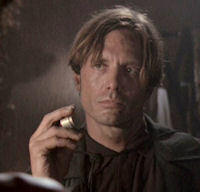 Meanwhile, in the saloon, JD asks the others their intentions. At first all of them seem to be staying. Nathan still believes he can do good doctoring to people, and Ezra is only a few hundred dollars short of buying the saloon. However, Ezra's plans are immediately ruined when Bryce arrives and nails up a poster that prohibits gambling and drinking after 11 pm. Most of the townsfolk are pleased by the new marshall and the new laws. When Chris is ready to ride out, JD is surprised when all but Buck joins him. Josiah is no longer needed at the church, and Bryce has made it clear to Nathan that he thinks he is a charlatan and wants him to stop doctoring. Ezra sees no future in a town that has a curfew on gambling and drinking. It's apparent that Vin and Chris plan to meet up later after Vin locates a missing Army wagon. They all ride in different directions leaving JD standing on the street alone. Bryce approaches JD and JD hands over his guns. In the meantime, word gets back to the ranchers that the town is no longer under the protection of the Seven, and they make plans to hire men and turn it into a ghost town so they no longer have to drive their cattle in a large circle around the town. JD has decided to join the Texas Rangers but is waiting for Buck. Unfortunately, Buck gets into trouble with the new Marshall after being seen relieving himself in a side alley. He is thrown into jail. Mary offers JD a job at her newspaper office but Billy lets slip that she has only made the offer as a favor to Casey, who wants JD to stay. Bryce sees Mary and they talk. Unfortunately, Bryce has old-fashioned thoughts concerning a woman's place that riles Mary into deliberately going against his words. She tells him she intends to carry on working with or without a husband, and drinks a glass of whiskey. Bryce is unsettled by her challenging attitude. When Buck is finally released, he gets arrested almost immediately after being caught kissing and fondling a lady in public and he is thrown back in jail. 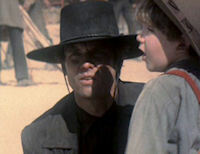 JD gives up and heads for his horse, intending to leave the town without Buck rather than wait on him any longer. As Mary watches him ride out of town in one direction, she turns and sees Earl and the ranchers hired guns ride in from the other direction. She rushes in to Bryce to warn him. Buck offers to help but Bryce insists that he can handle this alone. Earl and his men gun down Bryce. Chris arrives in Purgatorio and enlists the help of a local whore--Maria--to find out the information he needs concerning Fowler and his contacts. He offers her several dollars in exchange, and she offers him more in return. Later, having learned from Maria than no one has any information, Chris gives Maria the money anyway, saying she earned it, and as he sits contemplating his next actions, he hears a commotion in the street. Mary is riding along the street, being pestered by numerous people. She looks scared but determined, and Chris goes to her immediately, telling the others to get away. They obey him quickly and after helping her off her horse, Chris asks her why she has ridden into Purgatorio alone. Mary explains what happened after they all left and that they have left Bryce to die in his own jail house. They have given everyone only a short time to pack up all their possessions and then they will torch the town to the ground. Chris immediately agrees to go back. Vin has located the missing wagon and is waiting on a hill overlooking the town trying to decide what to do. In the distance he can see the town in turmoil with small fires already breaking out. Chris arrives with Mary. Chris: Been looking for you. Got trouble in town. Chris: You and me alone aren't gonna be enough. They leave Mary watching Vin's prisoner while they ride off in search of the others. First, they head towards the Indian village where they hope to find Nathan. They find Nathan pulling a tooth and discover that Josiah is not too far away. He is up on the ridge asking for a sign from God, only to have a DOG come and sit by him. He is musing on God's sense of humor as the others ride up. He agrees to join them. As they ride towards the nearest town, they see Ezra riding hard towards them. He has managed to get into trouble already, managing to escape before he was properly tarred and feathered for cheating at cards. The five head back to the hill where Mary is organizing the frightened townspeople who have been driven from their homes and stores. When they look in the boxes on the army wagon, all they contain are uniforms. When Josiah places ones of the army hats on his head, Chris has an idea. First, they go help JD spring Buck and Bryce from the jail, only to learn that Bryce died of his wounds. Ezra rides through the town yelling that the army are on their way. Pretending to be the army, the rest of the Seven ride into town with many of the towns folk dressed up in uniforms. Ezra joins them. They also have a cannon with a single shot. They line up along the width of the street and wait as many of the hired guns flee. When Earl realizes that they are not Army, he opens fire and the battle starts. The Seven take on the hired guns while the townsfolk start putting out the fires. Ezra uses the single canon shot to take out a group holed up in the bank. Eventually, the dust clears and the town is back under the control of a grateful people. The Judge returns as the Seven are helping to fix the damage. He questions the hired guns but all they will say is that Earl hired them so the Judge cannot go after the ranchers. The Judge has told the Railroad bureaucrats that he has hired Seven men to look after their interests but Chris says he will not work for the railroad. The Judge makes it clear that they are unofficial and that the town needs them a little while longer on the same terms as before. Chris speaks up for all of them. Chris: Well boys, what say we head over to the saloon and ponder the Judge's proposal. JD: Reckon I can do some pondering. The Seven stride off down the center of the main street towards the saloon.